Now the client will be developed with some error handling and proper logging. 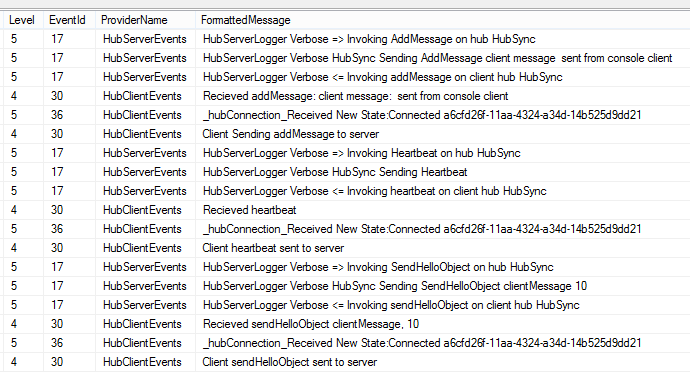 This example is a robust client, which can restart or handle any client, server events. A base Hub client class is created, so that each Hub client doesn’t need to re-implement the events or the start up logic more than once. This class is an abstract class. This forces the implementation of the start method. The class provides a State property and methods to start and stop the Hub client. Using the Hub. A new instance is created and messages can be sent as required. In a productive application, the received message events would probably be passed on. In this demo, log messages are written. The demo application uses OUT-OF-PROCCESS Slab logging to show the events. Here’s the client EventSource class. Compared to WCF full duplex communication, it is very easy to implement a robust full-duplex messinging system. SignalR has also less problems with firewalls unlike WCF NET-TCP.